Police Chief Jay Prettyman is sworn in with his wife, Tiffany, at left, daughter, Chloe, holding the Bible, and father, John N. Prettyman, as Judge Richard Russell conducts the ceremony. 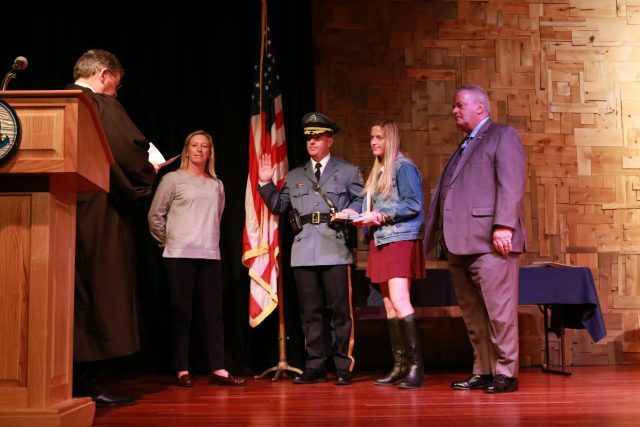 Ocean City Police Chief Jay Prettyman stood at the podium Wednesday night after being sworn in to officially assume his duties as the top law enforcement officer in the city. He made one thing clear. He will lead his department, and he will do it well. But the credit should go to the dedicated men and women he works with who make the department strong, he stressed. He credited his predecessor, retired Police Chief Chad Callahan, for guidance along the way in a career that began in the department 25 years ago. “I had the good fortune of working side by side with him as my boss. He has helped me,” Prettyman said. 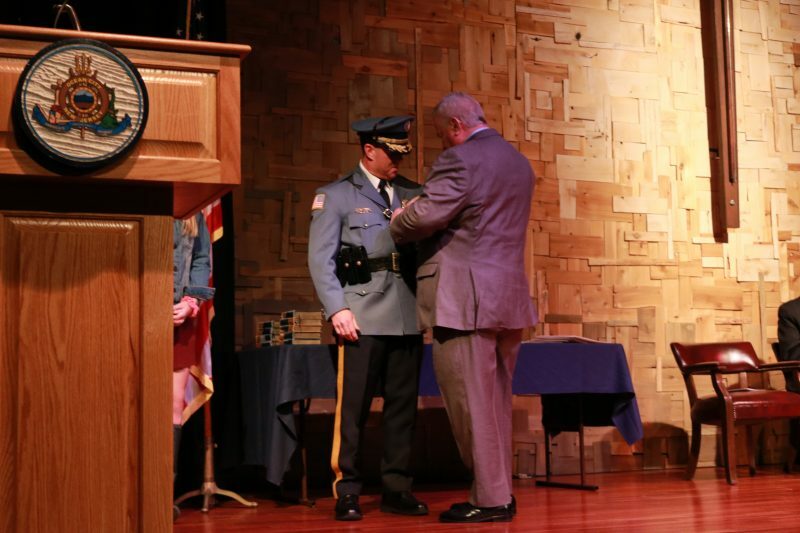 Chief Jay Prettyman watches as his father, John N. Prettyman, places a pin on his lapel. 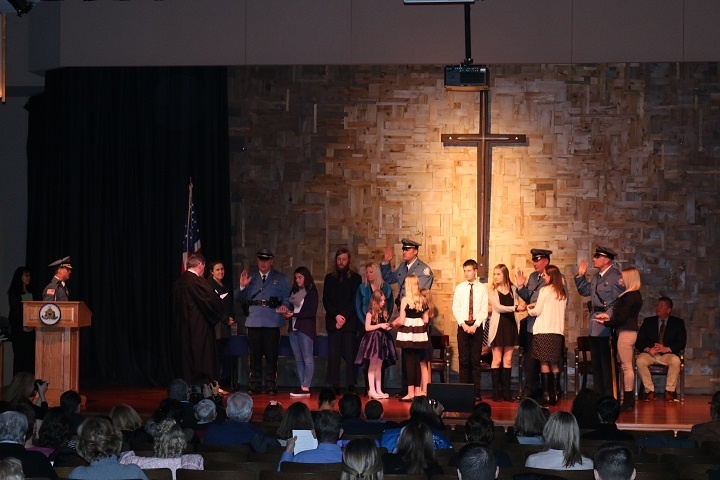 During the ceremony, performed by Judge Richard Russell, Prettyman’s wife, Tiffany, stood by his side, as their daughter, Chloe, 16, held the Bible. 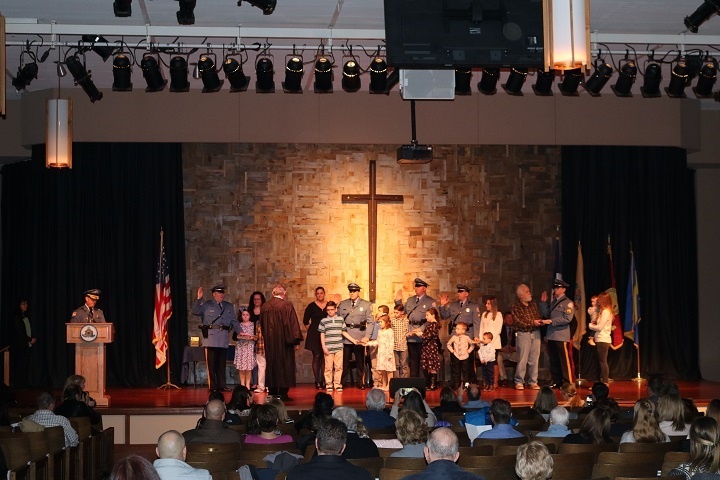 Also on stage was the chief’s father, John N. Prettyman, a retired deputy chief from Voorhees Township, Camden County. Prettyman said throughout his career, from the many assignments, to erratic schedule and long hours, his wife has always been supportive. He recalled how the two met while working at a restaurant in Ocean City over the summers. She went on to become a history teacher, he went into the police academy. “She has given me the time and flexibility to get to where I am today, so I thank her for that,” Prettyman said. He pointed out that both Chloe and the couple’s other daughter, Phoebe, 20, who was away at college and could not attend the ceremony, have been understanding of their father’s job, which he admitted could be difficult for young people who live in a town where their father is a police officer. Police Chief Jay Prettyman says he is excited to be the new chief and is ready to work. 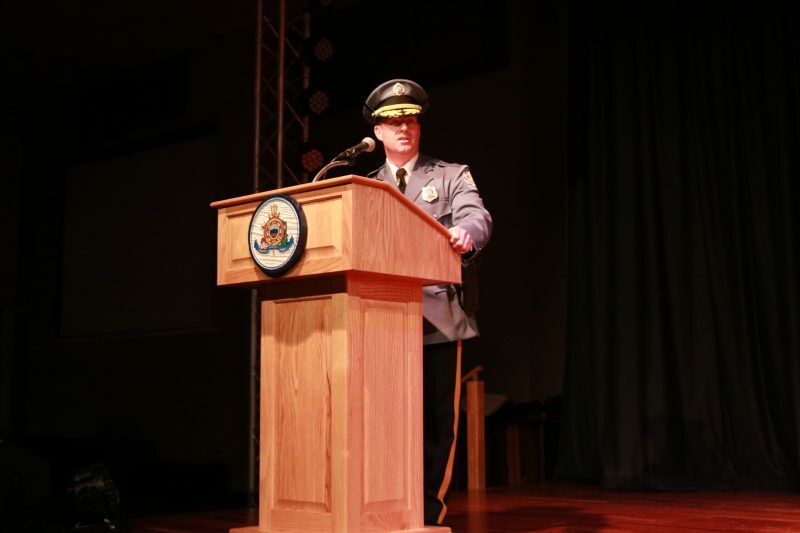 Prettyman began his law enforcement career serving as a summer police officer in Ocean City in 1992 and 1993. He joined the department full time in 1995 and worked his way up the ranks. “We are making official what we already know,” City Business Administrator George Savastano told the audience of Prettyman’s qualifications and leadership abilities. Savastano, who spoke on behalf of Mayor Jay Gillian, who could not attend the ceremony following the death of his mother, called Prettyman a great man who is professional, compassionate and enthusiastic, a man who will lead the department well. Savastano then said that the men and women in law enforcement put their lives on the line every day. Capt. Charlie Simonson hugs his son, Jonathan, a new police officer, moments after the swearing in. In addition to Prettyman were the promotions of captains, lieutenants, sergeants and 10 new hires. For all of the ceremonies, performed by Judge Russell, families and friends filled the stage. The two new captains are Capt. Bill Campbell and Capt. Charlie Simonson. Simonson, who has worked in the department for 32 years, commented after the ceremony that he feels great about the department. 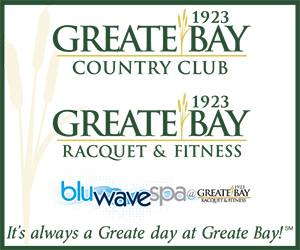 “I am fortunate to be a member of a good team. It is the best team and it is a wonderful experience,” Simonson said. Four lieutenants were also elevated to their new posts. They are Clinton Helphenstine, Brian Hopely, David Rowland and Robert Reichanek. 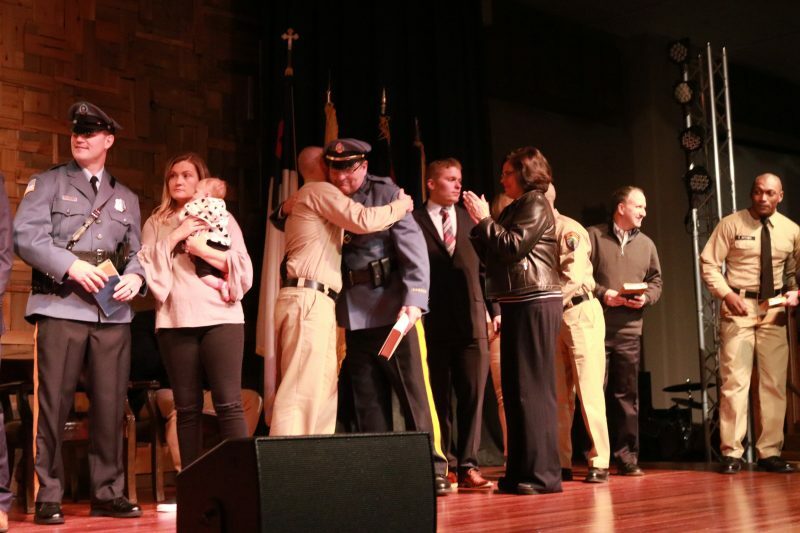 Lt. Brian Hopely and his wife, Danielle, hug after he is sworn in, while their three daughters hold the Bible. Also sworn in were five sergeants. They are William Lick, Anthony Fearnhead, Patrick Walsh, Peter Kardas and John Vogt. 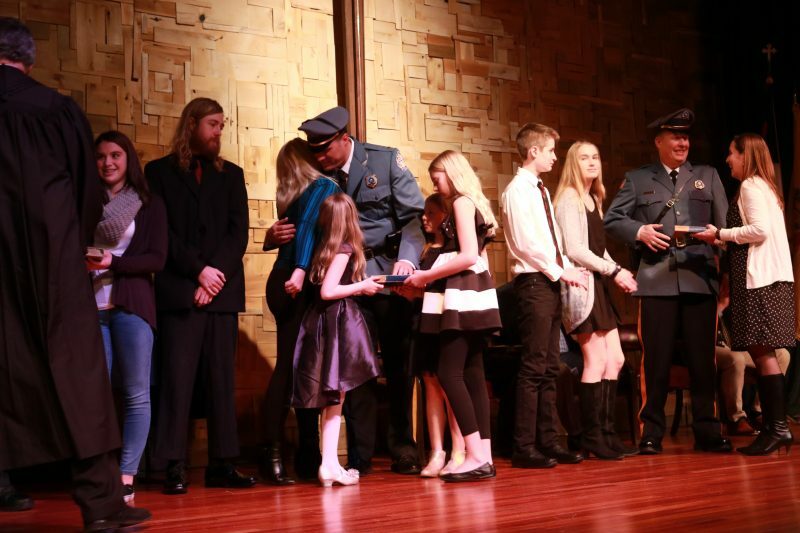 Simonson’s son, Jonathan Simonson, was sworn in as a new officer in the department and joined his father, brother, Edward, and mother, Jacqueline Simonson, on stage during the ceremony. In addition to Jonathan Simonson, new officers are as follows: Michael Hinsley, Jacob Johnson, Neal Cullen, Steven Schmidt, Jenna Cuomo, Clayton Harper, Randall Clark, James Crowley and Benjamin Bethea.